When Onya McCausland visited a former coalfield in Lancashire, she found both a source of materials for her paintings and a potential business idea. Water treatment plants based at several former coal mines produce clean water for local systems. 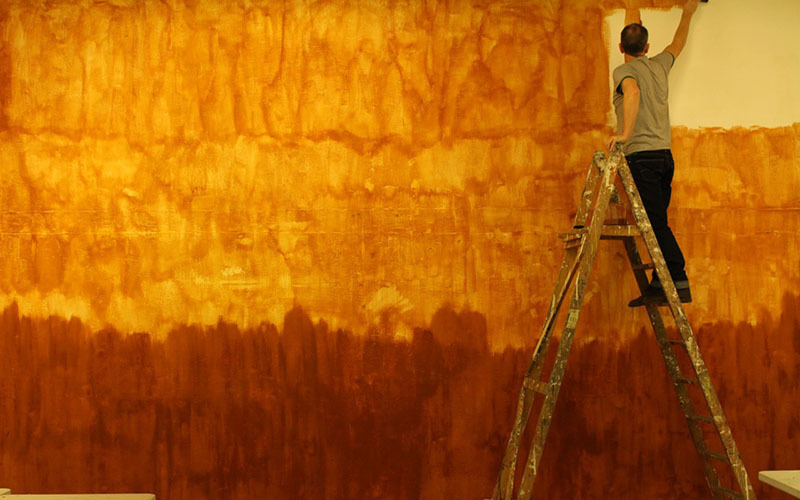 In the process, they extract and leave behind some 4,000 tonnes of ochre waste a year. Onya, studying for a PhD at the UCL Slade School of Fine Art, saw the possibility of transforming this waste into ochre pigments for the fine art market. The project also attracted interest from UCL’s Earth Sciences Department and UCL Culture. With help and knowledge exchange funding from UCL Innovation & Enterprise, Onya was able to develop a feasibility study and a business case. This paved the way for a joint venture between UCL and The Coal Authority. In addition to producing the pigments commercially - a project which is ongoing - UCL and The Coal Authority are also developing a public engagement project at the National Coal Mining Museum for England in Wakefield and Yorkshire Sculpture Park. The intention is to positively alter public perceptions of coal mining waste, so that it's seen as something with artistic and historic value. There are plans to designate the locations of former mines as art sites. In turn, it's hoped that this will boost cultural tourism and benefit local communities economically. The colours developed from coal mining waste by Onya were displayed at Five Landscapes, an exhibition staged at UCL in April this year. Each colour was developed from mine water from treatment schemes in five former coal mines in Scotland, Lancashire, Yorkshire and South Wales. The exhibition was accompanied by a symposium, bringing together academics from the UK and the United States to discuss the materials and science behind the project. An academic publication on the mineralogy of waste mine water ochres is being prepared. As a result of the impact created by her research, Onya was recently awarded a Leverhulme Early Career Fellowship at the Slade School of Art. This will allow her to continue her work on this project for at least the next three years. Onya is currently showing work at Anima Mundi Galley in Cornwall.